Every Filipino are now expecting the 16th President of the Philippines what he will wear on his inauguration ceremony on June 30. But presumptive president Rodrigo Duterte already give a hint on what he want to wear on that day. Duterte told to the press people that he will not hiring a personal stylist. He just want a simple life without any adjustment from himself. The incoming president finds wearing the native shirt “corny” and would rather sport something more comfortable. He said, "I don’t like barong. I don’t like Amerikana (suit). Maybe I’ll wear a kimono." Then he added, "You know why? Almost all of my friends who died wore barong (at their funeral)." Duterte was known as a 'simple man,' wearing white shirt and black pants when he faced the press media. He boldly said, "I don’t want to adjust my life just because I’m president. It’s so corny. You take me for what I am." Some of the Netizens give their thoughts and comments regarding the said issue. "Mr. President, you are now being watched by million Filipino fans...You are now the most saleable commodity. What you wear, what you do, everybody follows. You are the Innovator, trend setter. It is time that Barong be noticed and wear by ordinary citizen, employee and corporate executives here and abroad. That way...that would be good business for our fashion designers of barongs, good for the economy," JuniorTulo said. "well . things are easier said than done. let us just wait and see. tapos na ang campaign period. we all voted or the majority have voted for duterte. stop the hype and get back to reality. tapos na ang propaganda and it worked very well for duterte. gusto ng tao ng maginoo pero medyo bastos, and that was what duterte did. we all asked for it and we got it," pinoy_ako_pinoy_tayo said. "Barong Manobo style ang i suot nyo Meyor. Para may change of presidential outfit talaga, from Mindanao natives pa.." Mon Dragon said. "A lightweight tropical suit would be smart- the British in old colonial days used to have a short sleeved suit jacket and shorts. but if not just a thong and knee high rubber boots/ So long as it's not some puke yellow golf shirt," buttones said. On the other hand, President Rody's spokesman for transition team, Peter Laviña said that the inauguration will not do a lavish balls and dinners that are usually part of a president’s inauguration. He said that the venue of Duterte's inauguration will be held in Malacañang and would be witnessed by a limited number of guests. 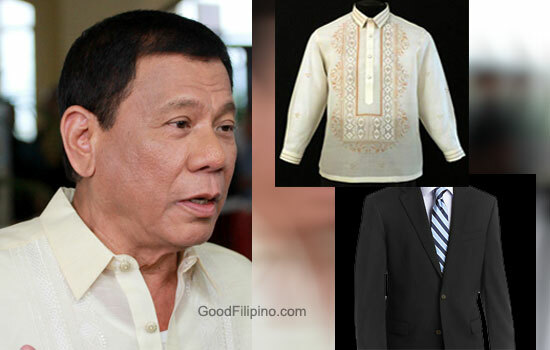 What do you think of the President Rody Duterte will wear on his inauguration on June 30? Share your thoughts below. Comments or suggestions about "President Rody on his Inauguration: 'I don’t like Barong, I don’t like Amerikana'" is important to us, you may share it by using the comment box below.